Here two homes that are just a block away from one another illustrate the drastic differences in the span of one block. 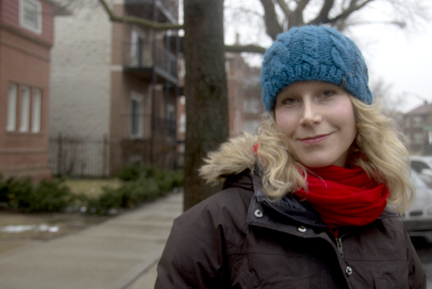 Curious citizen Marya Lucas on location for our story in South Shore. 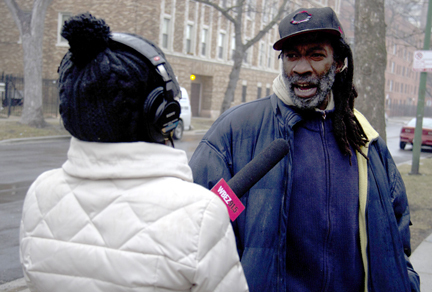 Natalie Moore interviews Lawrence Wilder, a landscaper and maintenance man, has lived on 74th and Coles Ave. for most of his life. It's easy to see the discrepancies in the Highlands neighborhood from above, as well. 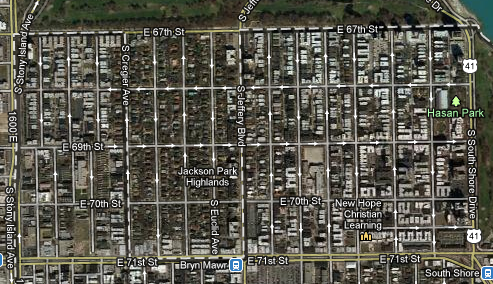 Note the swath of green in the middle, which are landscaped yards surrounded by apartment buildings. A study in contrasts on Coles Avenue is evident in other kinds of property, too. Here two cars tell two very different stories. For urban dwellers and fans of cliché Hollywood flicks alike, you’ve probably encountered the “wrong side of the tracks” motif. It goes like this: A neighborhood changes for the worse on the “other side” of the tracks or one must be careful of the people who live on the “wrong” side. The warning isn’t always about railroad tracks, of course. Instead, it’s a veiled admonition about which streets to cross or avoid in a particular neighborhood. Why do neighborhoods sometimes change from really good to really bad in the span of a block? The question, she says, was partly inspired by her move to Chicago’s Old Town neighborhood not long ago. There, she couldn’t help but notice how different life was on either side of North Avenue, around Sedgwick Street. It’s not a simple question, nor is there an easy answer. 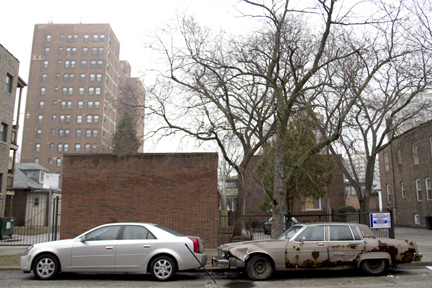 There’s ample scholarly work about neighborhood space in Chicago and how it’s polarized. The bottom line is that any full, honest answer must grapple with some unseemly history: racist real estate policies, the creation of ghettos and local political power. I’m never one to shy away from race, but in taking up this Curious City question I didn’t want the issue to dominate an explanation of why there are “good” versus “bad” blocks. My editor and I thought seasoned experts (e.g. people who wrote the aforementioned hyperlinked books and academics such as Northwestern University’s Albert Hunter) should take on that heavy lifting, but we could offer some on-the-ground observations and other perspectives to round out Marya’s question. First, a practical question: Where could Marya and I head to see and hear about block-by-block neighborhood change? We could’ve harkened back to Studs Terkel’s book “Division Street” for modern-day inspiration, focused on areas around public housing, visited Canaryville, compared Hyde Park (home to the University of Chicago) to Woodlawn (too easy) or pulled the microphone out in Uptown. Neighborhood disinvestment is hard enough to explain without the white side being the so-called more desirable one and people of color living on the “other” side. Hence, Marya and I headed to a majority black South Side neighborhood, where the gulfs between people and space are surprising and visible. On South Coles Avenue, between 75th and 71st Streets, boarded-up apartment buildings and houses stand out as eyesores. Residents complain about loitering at one of the corner stores. At one point residents say the Chicago Police Department designated one of the corners a hot spot for drug and gang activity. But just one block over, on South Shore Drive, high rises face Lake Michigan. On the dead-end side streets, oversized bungalows with well-kept lawns have direct access to the beach. One sleek modern home looks like it got lost on its way to South Beach. Several blocks away in the same neighborhood, homes in the Jackson Park Highlands are stately and splendid. The homes’ diversity in architecture reinforces the pleasing aesthetic. Car access is blocked on either side of the Highlands by uninviting pedestrian malls. There, multi-unit apartment buildings — many boarded-up — are crammed together in high density. Hover over the map below to view more images of the neighborhood. South Shore is truly mixed-income. Approximately 2,700 housing vouchers are in use there, meaning that Section 8 subsidized housing is more present here than in any other Chicago neighborhood. I happen to believe the best skyline city views are in South Shore (and I’ve got company in that opinion). There’s a modicum of commercial activity, Obama’s favorite pizza place and large homes with lots of hardwood character and detail. There’s also crime, and it&apos;s home to the Terror Town faction of the Black P Stone Nation. And all of this is in plain sight. Lawrence Wilder, a landscaper and maintenance man, has lived on 74th and Coles Ave. for most of his life. He said families have struggled to pay property taxes and utilities when senior citizen homeowners pass down their houses to their children. Wilder notices the differences between South Shore Drive and Coles Avenue. The day Marya and I ventured out, we brought along Janet Smith, an urban policy professor at the University of Illinois-Chicago. At one point, while sitting in the car and admiring the vista of the lake while parked on one of those South Shore Drive cul de sacs, Smith weighed in on what distinguishes this area from Coles Avenue. “[People] are connected to that space of the view of the lake, view of the city. They’re holding onto the piece of land. It’s a foothold to the beach. They can literally have their back to change around them — good or bad,” Smith told us. Further west, there’s another desirable section of South Shore — the Jackson Park Highlands — with borders at 67th to 71st, Cregier Avenue to Euclid Avenue. There’s no access to the Highlands from 71st Street, and inside the four-block radius lies a mini-labyrinth of one-way streets and cul de sacs. (I was told if criminals are confused, they’re less likely to enter.) Every new homeowner receives a welcome basket of food and pays $50 annually to the neighborhood association, which funds mosquito abatement, holiday events and summer functions. The housing stock is similar to a Hyde Park or Kenwood but at a much lower price point. Yvonne Webb and her husband moved to the Highlands almost 40 years ago. If an ambulance pulls up to a neighbor’s home, the phone rings. They let each other know when they travel out of town. They have phone trees to call the police. There are just a few apartment buildings within the Highlands. But on the margins of that community lie huge multi-unit apartments. Tammye Coleman, a nine-year Highland resident, said apartment dwellers aren’t afforded the same type of community-building opportunities. “If landlords had that same mentality, or [if] someone could organize fun things to do. You rarely see block club parties on a block that’s all apartment buildings because then who coordinates it? You never get a chance to meet your neighbors,” Coleman said. Smith said renters aren’t inherently problematic. “I raised a lot of questions about who owns the properties, the multifamily properties. What their intentions were. Were they there to milk the property? So buy it cheap, just put a little bit in, maintain it so it meets the code? Have tenants in there but charge higher rents than they need to. It felt like it was about real estate investment first and not about community,” Smith said. It was clear from our visit that South Shore residents think about the space they live in, and they see it connected to internal and external forces, too. The physicality — the impact of the lakefront, the cul de sacs, the pedestrian malls and the street restrictions — plays a major role. And, as we heard from both residents and Smith, economics and ownership contribute to how different one block can feel from the next. The sections of South Shore with strong community associations fare better when it comes to keeping their blocks safe and pretty. No one Marya and I spoke to suggested that there were too many apartment buildings in South Shore, but it’s clear those residents — many of them low-income or lower-middle class — don’t have similar safety nets of phone trees and block clubs. Their landlords don’t invest in those efforts. And it makes some sense; they’re investing in beachfront property, perhaps waiting for paydirt. Put enough of these different incentives close together, and you build a small, but real, division — one that’s apparent to neighborhood natives and newcomers alike.